Why have I always loved horror flicks? Especially that genre known affectionately as Grand Guignol (or actually, a subgenre called Grand Dame Guignol, which specialized in putting female stars of, er, a certain age, into gory, violent and, to me, mesmerizingly scary horror/suspense films)? 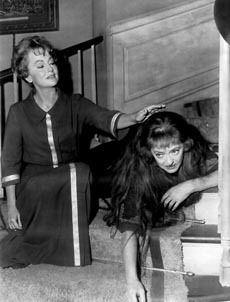 As I was a young, impressionable (gay) kid at the time, I immediately fell in love with Bette Davis, Joan Crawford, Agnes Moorehead and Olivia de Havilland - especially the latter two in one of my all-time favorite shock (some will say schlock) fests, Hush…Hush, Sweet Charlotte. Seeing this film in an actual movie house when I was eleven had a very visceral effect on me, not unlike seeing The Exorcist nine years later in a crowded, sub-zero Times Square theater, packed to the gills with people fainting and throwing up around me: I was scared shitless. Well, okay, Charlotte didn’t have people upchucking in the aisles. But there was plenty of screaming. The plot is as old as the hills: sweet cousin Miriam (de Havilland) and boyfriend Dr. Drew (Joseph Cotton) conspire to drive Miriam’s cousin Charlotte Hollis (Bette Davis) crazy. Miriam is the sole heir to the Hollis fortune after Charlotte. So one little committal (as in, to an institution) will leave Miriam and Drew happily ever after. 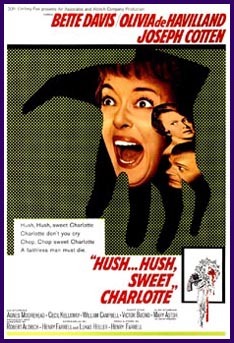 The reason their scheme is almost foolproof is that Charlotte has been slowly going mad for 40 years, ever since she discovered the decapitated and mutilated body (a severed hand) of her married lover, John Mayhew (Bruce Dern, in one of his first big-screen appearances) in the family summer house during a big party. Walking into the main room, carrying the murder weapon, dress covered in John’s blood, Charlotte was assumed to be the murderess, though it was never proved. For four decades, Miriam’s been gaslighting Charlotte through the mail, and has finally decided to finish the job in person. Several things stand in her way: Charlotte remains sane enough to resist leaving her childhood home, and maid Velma (Moorehead, in a nuanced performance that should have won her the Oscar for which she was nominated) knows something’s up the minute Miriam floats in with her soothing voice and calm, yet somehow chilling, demeanor. The real feast of this movie is watching the four leads play off against each other, which they do astonishingly well…some of it due, perhaps, to their careers having intersected more than once during Golden Age Hollywood. As a kid, I remember being scared out of my mind when Dern’s head rolled down the long staircase as Davis screamed her lungs out; when Charlotte hears the haunting title melody played on the mansion’s harpsichord and thinks her long-dead love has returned, only to discover his severed hand under a loose floorboard; and as a crazed Charlotte, thinking that that she’s killed Drew, is forced by Miriam to help dispose of the body. In other actors’ hands, this might have, indeed, just been a throwaway D picture. But watch Davis show you the light behind Charlotte’s broken eyes, especially when the truth is revealed at the end; note the surprising strength Moorehead invests in poor, doomed white-trash Velma; and listen to the way de Havilland practically coos her lines…but with the subtext only a great actress can offer. Charlotte and other films of its ilk started me on a path that led to a life of devouring classic (and not-so-classic) movies — especially horror, supernatural, and suspense flicks. And for that I will be forever grateful.